Eliza Gregory grew up in San Francisco and moved to Phoenix in 2006. She is the recipient of a 2008 Arizona Commission on the Arts Project Grant to support her work making portraits of resettled refugees in Phoenix. Thanks to a public art commission from the City of Phoenix, last year she had a photograph on display at the bus stop installation at 7th Avenue and Glenrosa, and last spring she was honored by a Contemporary Forum Artist Grant Award. 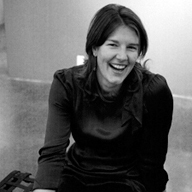 She joined the Eye Lounge Gallery and Artists' Cooperative in 2007, and has served as the Cooperative's co-president since 2008. Her next show of new work, Refugee Status at School, will open April 17th at the eye lounge and run through the second weekend May. Superstition Review Art Editor Danielle Kuffler had the opportunity to learn more about Eliza Gregory, the artist and the person, through an enlightening interview. She says of the experience, "Speaking with Eliza was fantastic. Viewing someone's artwork before meeting her is sometimes a bit strange, but I immediately perceived a connection between the artist and her work. I was drawn to the honesty in Eliza's photographs, and I found her to be extremely genuine and generous in her answers to my questions. I am honored to have had the chance to carry on a conversation with an artist whose work I respect. Eliza offered me a great perspective not only on the Phoenix art scene, but also on life as an artist in general. I look forward to viewing her new exhibit at Eye Lounge gallery in Phoenix." Superstition Review: Your work is in portraiture of everyday people—what attracts you to portraits? Eliza Gregory: I love people. I am really interested in people. Not only have I been interested in photographing people for a long time, but I am also intrigued by literature and examinations of human behavior. I am interested in exploring human experiences and emotions, and also in building a narrative through photographs. SR: How do you choose your subjects? EG: The process is an ongoing evolution. I learn about why I chose the last subject when I choose a new one. Recently, I have been interested in community as my subject. On a social level, the change I want to create with my work is based on community and helping the individual connect with others. My work is about community in two veins, one of which is my own family. Not just my immediate family, but also my extended family. I think extended family is becoming less and less important in our society. Although we all live in different places, there is a very unique sense of community within my family. For example, we all come together for the Fourth of July each year. I feel happy and supported in that environment, and although we don't all necessarily know what is going on in everyone's lives, we are fulfilling a basic human need for familial connections by coming together. When people see photographs from my family gatherings, they can relate. Also, photographing my family allows me to check myself. I want to make sure that I am not exoticizing or exploiting people who are different from me through my photographs, and family tells you the truth about your work-they hold you accountable for your actions. Family is not a temporary connection, but rather a permanent and important one. Photographing my extended family allows me to talk about a certain type of community, and how it impacts my life. It is about exploring my own cultural identity. The other vein of community which I explore through my work is communities that are isolated and have had to negotiate drastic changes in identity. This involves photographing resettled refugees. The refugees are cut off, and their community has been disrupted multiple times. They are living in a situation where internal cultural expectations are different from external cultural expectations, which can be incredibly isolating. I want to bring attention to the refugees, and what its like to negotiate feelings of isolation within a large culture. I want people to connect with them and I want them to connect to others. I find their negotiation of a new culture fascinating. They are involved in a transition and the absorbtion of a new culture. This combines and creates a set of two cultural expectations within an individual. SR: How do you capture a spontaneous moment in a portrait, or how do you stage a portrait? EG: Well, I work with a large-format camera which is enormous and very slow. It has to be on a tripod. I like this about it because the handheld camera obscures my face while photographing. There is a very weird dynamic when using a handheld camera; it creates that impression that I as the photographer am a machine, and you as the subject are very vulnerable. This dynamic occurs especially when I photograph people who are not frequently in positions of power. With the large-format camera, I stand apart from it. This way I am in a less dominating physical position with subject, which means a lot to me. The large camera also sets up different social dynamic when I am in the process of photographing. It is a weird contraption, and becomes something of a curiosity. People ask questions about it, which is useful in finding subjects. SR: What are the benefits of this approach to photography? EG: The process of taking the photographs is very interactive. I tell the subject where to stand, that they must hold still. It is hard to get a spontaneous picture with this camera, but I prefer it because the subject is empowered. It is a collaborative and consensual process. SR: How did you get into photography, and what was the learning process like (any formal training)? EG: I got my first camera at age 7…it was one of those flat, long, push-button types-a candy bar camera. I took terrible pictures at first. I worked on the school yearbook when I was 12 and 13. I liked looking at pictures, I thought they were really powerful. I was very interested in photojournalism. Photojournalism tells stories about things that are contemporary and relevant, but also beautiful. Photographs interested me more than painting because they are transcendent, ambiguous, and emotional. They reveal feelings as much as facts. I think pictures should talk about world we live in and human experiences, but also emotions and beauty. Then in college at Princeton I did a lot of formal photographic education, and also took some great photo classes as a non-degree graduate student at ASU. SR: There is a strong presence of family and community ties in your photographs. How has your own childhood or family life had an influence on your current work? EG: Family and keeping in touch with family is really important to me…I know all my second cousins, I am close with grandparents' siblings. This presence of family was manifested in my childhood through visiting my extended family. SR: What role does travel play in your photography? EG: I traveled to Cuba for my thesis research, and I went to Tanzania on a fellowship as a part of Princeton in Africa. Travel allows you to confront your own cultural identity and expectations, which are important elements in my work. Also, out of your normal environment you feel freedom to do things you wouldn't normally do. Taking pictures of people is terrifying at first…it takes enormous brazenness and courage and insanity because you are constantly breaking social norms. Travel has been effective because I dared to reach out to people in a way I wouldn't if I were passing them on the street. Being abroad really helped me become more comfortable approaching people. But now I think I'm equally comfortable approaching people at home or abroad—I've had a lot more practice. SR: What about Phoenix inspires your work? EG: There are a lot of opportunities here. I have become interested in new things because I have had the time and space to explore things without scrutiny. Phoenix is a difficult place. Space is more important than the people…it's a city built with priorities of what individuals want rather than in the interest of community. I have gained a more genuine understanding about art's role in society since living here. When I started to learn more about the community of local artists that exists here, I came to appreciate the support they provide each other. I have learned that art is about community because it's about communicating and building bonds between people. Here in Phoenix, many artists are actively building community not only through their work but also by furthering urban development in downtown Phoenix. SR: What do you hope to achieve with your work? EG: My work is an exploration of culture, community, and the individual within community. Your own culture is inherently invisible to you at first; you take it for granted But exploring what each individual makes of his or her own culture intrigues me. It makes you realize that your reality is malleable, and that conflicts arise from thinking culture is not malleable. My work allows me to realize that any one of us could be any other one of us. I want people to question their beliefs and their concept of culture as something fixed, and in an indirect way help people feel more compassionate about each other. I don't have a specific agenda, but I would like to draw attention to the status of resettled refugees within the school system. I want to allow people to be aware of things, and to start a dialogue. A lot of people don't even realize that refugees live here in Phoenix, and they don't realize how many problems are present in the education system. SR: How did you get involved in photographing refuges? Has this affected the way in which you define “home”? EG: I was involved with the IRC (International Rescue Committee, http://www.theirc.org/) in Tanzania , which is how I got involved here in Phoenix. People get resettled in Phoenix because it's supposed to be easy to acclimate. There are a lot of low wage jobs and other opportunities, but the city has very little street life and lacks a community feel. It is easy to get isolated. Phoenix is the first time I lived somewhere without a preplanned community. When I arrived here, I had no job, no family, no school. Just my fiancé. I felt a similar kind of isolation in beginning. SR: Tell me more about your latest project. EG: I love looking at peoples' homes. I find it really exciting because different people from different cultures have such diverse homes. The differences in how they live are manifested in their surroundings. I am now involved in photographing people at schools. I am working on a narrative of refugees and the resettlement process, which is tricky. I don't want to label people as refugees. I want to go deeper than that. The main narrative involves the education system and peoples' experiences as refugees within the American education system. I want to explore the idea of multiple identities. All of the subjects have a huge range of experiences, based on all kinds of factors. So I also interview them and build their words into my work. Show at Eye Lounge (eyelounge.com): Refugee Status at School. The opening reception is on April 17 from 5-9 pm, and the exhibit continues Tuesday—Saturday from 10am-6pm, and every Friday night from 5-9pm through May 9. Or you can see it when you're out on the First Friday of May (May 1 st ) from 5-10pm.